with a distinct personality. Kerala culture has been an integral part of the mainstream Indian culture. At the same time its special geographical position enabled Kerala to enjoy its own outlook, way of life, culture and institutions peculiar to itself. From ancient times Kerala emerged as the meeting ground of all Indian religions and philosophical systems as well as the most important world religions such as Judaism, Christianity and Islam. parents Kuriakose and Mariam. The Chavara family is believed to be the descendant of the Pakalomattam family, one of the four that claim descent from the time of St.Thomas at Palayur, central Kerala. He was baptized on 18 February and on 8th September 1805 the child Kuriakose was dedicated to the Blessed Virgin Mary at the Marian shrine in Vechoor. At the age of five, he began his studies in the village school, called Kalari under a village master called Ashan. There he continued his studies until he was ten years old. Then Malpan Thomas Palackal invited him to his seminary at Pallipuram. Subsequently as he was too young he spent about two years in the parish rectory under the care of the zealous and loving parish priest. Here his parents also discerned his divine call. In the year 1818 he joined the Pallipuram seminary under the tutelage of Malpan Thomas Palackal. Not long after the tonsure he received, there was an epidemic in Kainakary and surroundings. His loving father, his good mother, and his only brother fell prey to the epidemic. As there was no heir in the family, relatives compelled him to discontinue seminary life and comeback to the family. But he arranged the family affairs in such way that he could continue his priestly studies. On 29 November 1829, at the age of 24, Bishop Maurelius Stabilini, Vicar Apostolic of Verapoly ordained him priest at St. Andrew's Church, Artungal. vicariate of Verapoly or at the seminary of Pallipuram to discuss the idea of a religious institute. 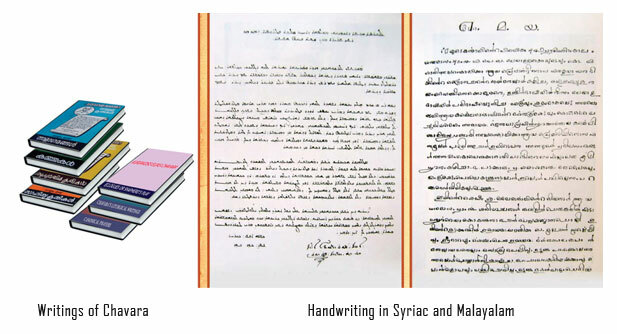 By the words of blessed Chavara, from the first page of his chronicle, we may allude to the request fathers Palackal and Porukara placed before the bishop Maurelius Stabilini Seeing that a lot of good has not been done due to the absence of a Thapasu Bhavanam (house of discipline) in Kerala even for priests, we desire to start a 'Darsana Veed’ (house of vision) at least for priests. The Vicar Apostolic, finally on 1st November 1829, granted permission to establish a religious house. 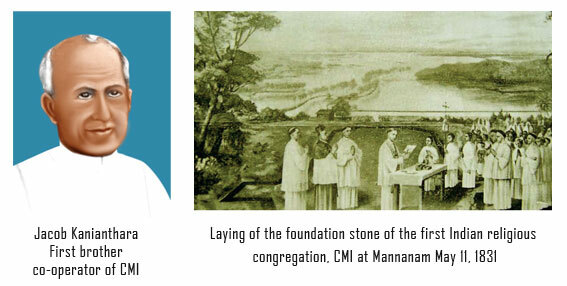 On May 11, 1831, the foundation stone for the proposed religious house was laid at Mannanam near Kottayam in Kerala dedicating it to St. Joseph. This was the first indigenous religious institute for men in the Indian Church of modern times, known now as Carmelites of Mary Immaculate (CMI). For, if at all there existed any religious institute before, no one continued upto that time. Jacob Kanianthara, who in 1865 became the first professed brother co-operator in the congregation also co-operated with those three founding fathers from the beginning. More members began to join the religious institute at Mannanam. However they did not have any written rule or regulations. In 1840, the members then present resolved to start a community life, sharing their assets in common and meeting all their expenses from the community. In 1841, on January 16, Malpan Thomas Palackal, and on January 8, 1846 Malpan Thomas Porukara died, leaving the whole responsibility of organizing the religious community to Malpan Kuriakose Chavara. On December 8, 1855, the first anniversary of the official proclamation of the dogma of the Immaculate Conception of our Blessed Mother, Chavara made the profession of the religious vows before Fr. Marceline Berardi OCD, the delegate of the Vicar Apostolic, assuming the name of Kuriakose Elias of the Holy Family. Then his eleven companions made their religious vows before Kuriakose of the Holy Family, who was constituted the Superior of the religious community. The new religious community was known at the time as 'Servants of Mary Immaculate'. Later from 1856 by the influence of the Carmelite missionaries, the community began to be known as 'Servants of Mary Immaculate of Mount Carmel'. In February 1861 the congregation was affiliated to OCD first order with name Third Order of the Carmelite Discalced (TOCD). St. Kuriakose Elias Chavara governed the Congregation for 16 years as the Superior General, under the name 'Common Prior'. The people at large took note of the transformation that was taking place in the Church and in the Malabar society through the apostolic activities of the members under the able guidance of Chavara. 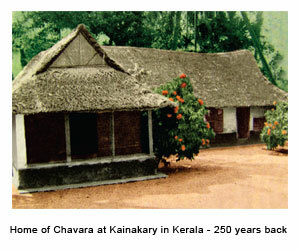 Thus priests and people from various parts of Malabar began requesting Chavara to open houses in their midst. 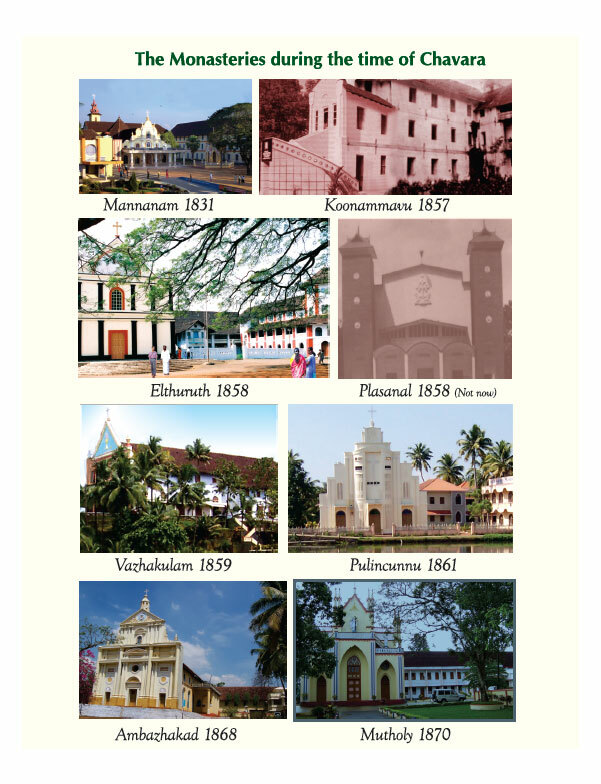 Thus Monasteries were started at Koonammavu-1857, Elthurutrh-1858, Plasnal-1858, Vazhakulam-1859, Pulincunnu-1861, Ambazhakad-1868, and Mutholy-1870. In order to carry out the apostolic activities in the Vicariate more efficiently, the Vicar Apostolic, in 1864, transferred St. Chavara to Koonammavu, which was near the Curia of the Vicariate. A religious congregation for women in Kerala was a great desire of Chavara. It was a long cherished desire of his and the result of several attempts, one at Alangad in 1857 and another at Puthanpally in 1859. In 1866, on February 13, with the co-operation of Fr. Leopold Beccaro OCD, an Italian Missionary, the first convent of the sisters was inaugurated at Koonammavu, under the name “Third Order of the Carmelites Discalced”. The motive of starting such an institute of religious life was for the education, empowerment of women folk and to take care of their spiritual needs. and social information; special attention to start catechumenates at Mannaanm in 1853 and with other monasteries, house for the destitute and dying at Kainakary in 1869; reunion movement; Sanskrit School at Mannanam in 1846 and school for the general education at Mannanam in 1865, a school and boarding house exclusively for girls at Koonammavu in 1868 etc. 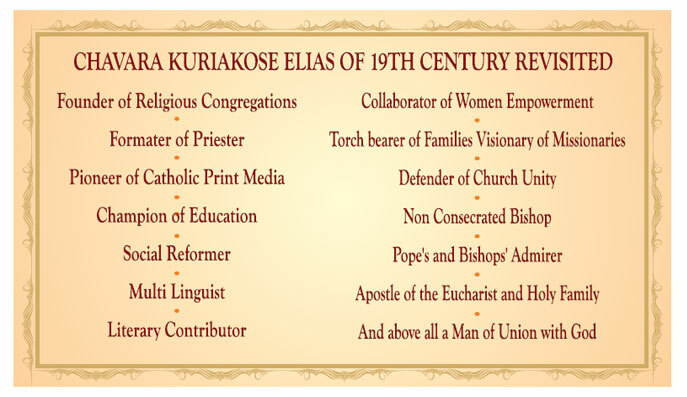 were among the few of various activities under St. Kuriakose Elisa's leadership. Thus he focused the area of ministry in (1) Educating the uneducated, (2) Helping them who desire to enter the Catholic fold, (3) Working for the reunion of the separated brethren. (4) Safeguarding the well being of all (5) Aiming at the renewal of the Church and (6) Willing to do all that are seen good for the people of God. In this way he prepared the religious, priests and the laity for the spiritual and social up-lift of the Church and society. A schism threatened the church of Kerala in 1861, creating a very critical situation. Fr. Kuriakose Elias Chavara, the then appointed Vicar General of Syro-Malabar Church, is gratefully remembered and acknowledged for his strenuous fight, strong stance and effective leadership in thwarting Thomas Rocco's intrusion and saving the church of Kerala from the Schism. On this account, the Holy Father Pope Pius IX sent him a letter expressing his great appreciation. Amidst his diverse and manifold activities, he found time and leisure to write a few books, both in prose and in verse like Atmanuthapam (The lame-ntations of a Repentant soul – a poem), Marana-veettil Padunnathinulla Pana (A poem to sing in the bereaved house), Anasthaciayude Rakthasakshyam (The Martyrdom of Anasthacia), Dhyana Sallapangal (Colloquies in Mediation) and Nalagamangal (historical notes as chronicles). He took initiative in codifying the liturgical books like canonical prayers for priests and prepared the liturgical rubrics called 'Thukkasa', liturgical calendar; Solemn sung Mass, Little office of Blessed Virgin Mary and office for the dead. His Eclogues are 10 Shepherd plays related to the birth of Christ. His counsels to the Christian families given in 1868 in the form of the “Testament of a loving Father” are universally applicable and are relevant to this day. As an instruction manual for families, already its lakhs of copies in 32 editions were circulated to the Christian families. The general theme that runs through Chavara's thinking is the mystery of man in relation to God: the greatness of God the creator and the ungratefulness of man, the creature. This consciousness created in him great sorrow for sin. At the same time he recognized the great love and mercy of God, the Savior, whom he calls 'My Father'. This confidence in the Father gave him hope and solution for all his problems and for the problems of others. In Jesus he realized the mercy of the Father, the greatest expression of God's love. The heart of Saint Chavara was a living abode of the three traditional virtues or ways (marga) of spiritual realization of India, such as Jnana (wisdom), Bhakthi (devotion/love) and Karma (action), very much promoted in the gospels and well extolled in the Bhagavad Gita. Real Jnana (knowledge/wisdom) is realization. Blessed Chavara, acquiring sacred wisdom from the Holy Scriptures, was always on the way of realizing his Divine Guru, Jesus Christ through his contemplation. This led him to think about the greatness of God, and there he met Jesus in bhakthi (love/devotion) as his Father. In his deep Father-Child relationship with Jesus, Chavara identified the fatherhood of God and brotherhood of his fellow being and it led him to serve others with Niskama Karma (Selfless action or service). Suffering is part of human life. 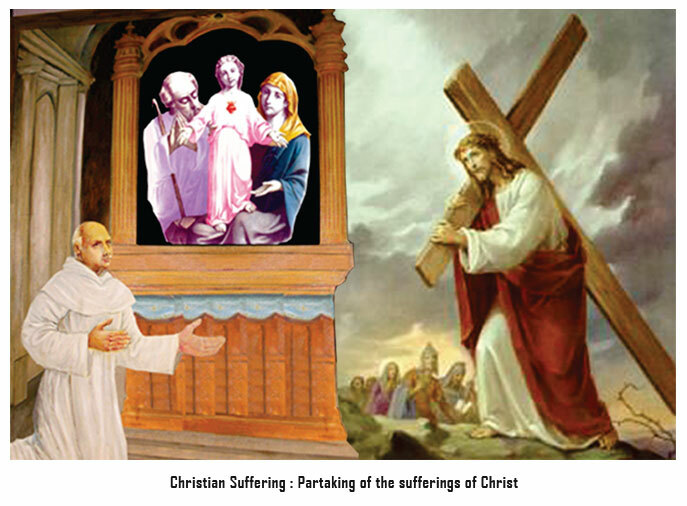 When one accepts sufferings as a participation in the sufferings of Christ, it becomes conducive to his/her salvation and sanctification and partaker with Jesus for the salvation of others. When one accepts suffering with this vision, it becomes an experience of love. Rheumatic fever, which Chavara contracted at a young age in his priestly career, was a constant companion of his till his death. Once in his apostolic activities he was affected by fever, so as to lose his senses for two days. He had to be carried in a palanquin to the nearby monastery. His legs were also affected by swelling which caused him severe pain now and then. For about three months prior to his death, his eyes were affected seriously and had acute pain. During that time he lost his vision completely. The medicines applied by doctors to regain his vision were also really painful though he never complained about it. much more when his loving parents and the only brother died, prey to the epidemic in the region; when the family itself became an orphan by the death of his parents and brother. He also had a very humiliating experience from his own parishioners and parish priest, when the traditional official entry to the church after receiving the tonsure was denied due to certain misunderstanding. The impediments that happened when the construction of the monastery had begun, impeding in a way the very project of the religious institute; when 2 priests 8 scholastics and one aspirant left the budding congregation on account of the hard rules imposed on it in 1855 by the apostolic vicar and missionaries, at the time of the first profession of the members; the schism that threatened the Malabar Church carrying off the great majority of the churches into schism, when the prominent people of the Church, like the Malpans, one after another left the mother Church and joined the schismatics; when the schismatics threatened to occupy by force the monasteries of Mannanam and Elthuruth etc, his sufferings should have been immense. But his faith in the divine providence was never shaken. It was in the providence of God that he found refuge on all these occasions. sick. He was totally blind for about three months. During this period he fixed a small note on the door requesting visitors to speak with him only spiritual matters. He also wished that good spiritual books might be readout to him in his room. Sensing the death of the founder all assembled around him in tears at his deathbed on the eve of January 2. There he said to them in a feeble voice: Why are you very sad, and are crying? Every man whoever he be, has to die one day. Now it is my time. As I had the protection of the Holy Family, I have never lost the grace I received in the baptism. I dedicate our little congregation and each of you to this Holy Family. May th e Holy Family reign in your hearts. After these words he asked for the sacrament of anointing. On 3 January 1871 at 7.30 in the morning he calmly slept in the Lord and was buried at St. Philomena's Church, Koonammavu. 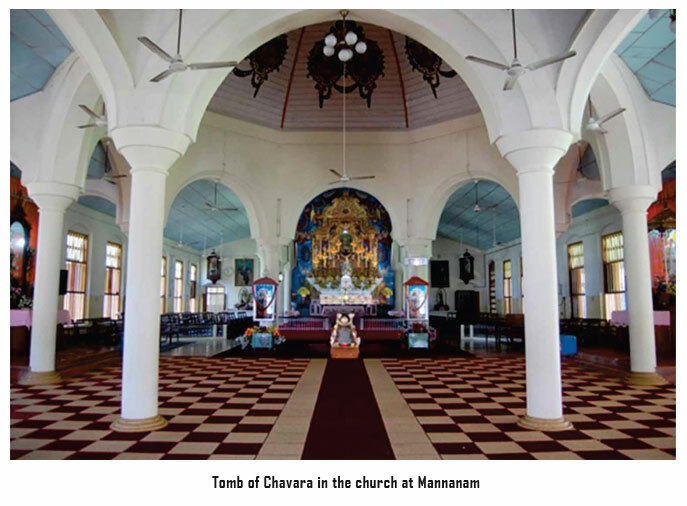 His mortal remains were later transferred from Koonammavu to the Mother House at Mannanam in 1889 and re-interred in the St. Joseph's monastery chapel. religious articles etc. asking the monasteries to conserve them all safely as sacred relics. We presume that he did this with the firm conviction of his saintly life and with the hope that he would soon be canonized a saint. Fr. Leopold might have taken the initiative to start the process of his canonization soon after his death. But he was called back to Italy by the end of 1875. Hence he could not do anything regarding the process of his canonization. However, the note which he wrote in his personal diary on the day of Chavara's death is very important, which ends with the words: Anima bella e santa, prega per me (O beautiful and holy soul pray for me). 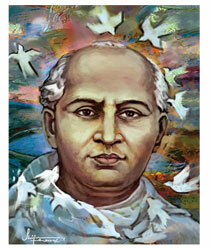 Chavara's canonization process was begun only in 1955. In 1957 the Archbishop of Changanassery officially started the process. 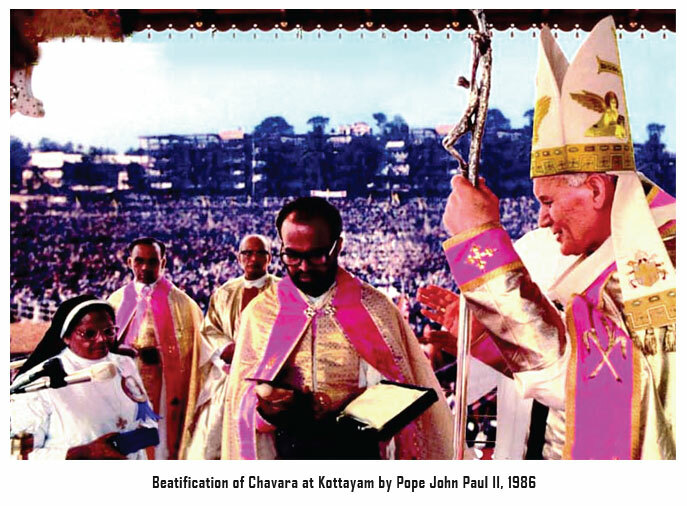 In 1984 April 7th Chavara was declared venerable and on 8th February 1986, Pope John Paul II on his pastoral visit to India declared him, Blessed at Kottayam, Kerala. 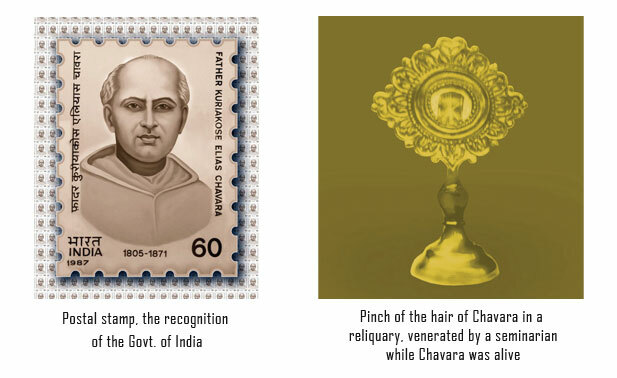 In 1987 Government of India released postal stamps in honor of blessed Chavara for his humanitarian services to the country. In 2006 Kerala government honored him by erecting his portrait painting in the hall of 'Kerala Sahitya Academy portrait gallery' at Thrissur, considering him as one of the literary genius in Malayalam of the 19th century. Bishop Francis Xavier Pescetto (1831-1844) constituted the Servant of God Malpan (worthy to teach and direct in the seminaries) and examiner of priests. Bishop Ludovic Martini (1845-1852) nominated him preacher of spiritual exercises in the vicariate. Bishop Bernardin Baccinelli (1852-1868) constituted him the vicar general for the Syrians of the vicariate and wrote in the appointment letter: “I am convinced that you have the fortitude, zeal, wisdom and the virtues necessary for the right fulfilment of this office.” The same Baccinelli described him before the Sacred Congregation of the Propaganda Fide recommending him for a bishop with these words: A man truly Christian, virtuous, very prudent, who in the circum-stances has shown with deeds, most attached to the Catholic faith and to the Holy See... He enjoys great esteem of the people and their respect and consequently wields great influence over them. A disciple of Saint Chavara, Fr. Varkey Muttathupadathu, had so much veneration for him that he treasured up a wisp of the hair of Chavara and later, he passed it on to his nephew. Bishop Leonard Mellano (1868-1897) esteemed him so much that he instructed Fr. Gerard and Fr. Philip who were the prodelegate of the vicar provincial of the Congregation and the provicar apostolic of Verapoly, respectively to do everything according to the counsel of Chavara. The Syro-Malabar Bishops' Conference, after describing him as “a man of prayer”, completed the description, by saying that “he practiced all the Christian virtues and that in a heroic degree.” They further elaborated: Divine faith, confidence in God, intimate and personal union with Jesus in the Blessed Sacrament, a tender love for the Blessed Virgin Mary, humility and charity were shining in him. Acknowledging him, along with the historical consulters, (Antonius Petti, the promoter general of faith) says that every page of the Positio brings to one's notice one or the other of the characteristic virtues of St.. Kuriakose, namely union with God, spirit of prayer, loyalty to the Church, humility, obedience, spiritual equilibrium and the zeal for the good of souls. 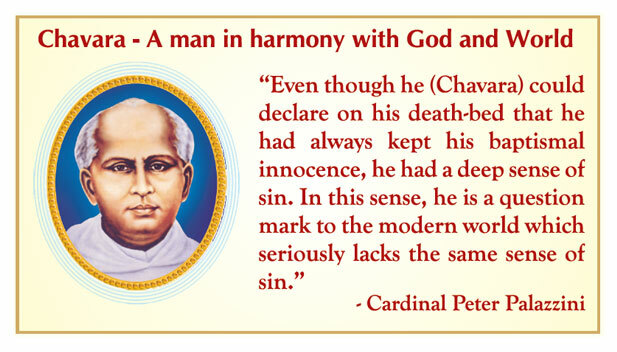 Saint Chavara is an answer to the modern world; a world tensed with activity and tired of involvement; a world which feels loneliness without a God and neighbor; a world which cannot stay silent for a moment and pray. For, Saint Chavara was a person who could live in harmony with God and the world, prayer and action, solitude and companionship. To a world, which is losing the sense of sin, he is a question mark. In a message by Cardinal Peter Palazzi, the prefect of the Congregation for the Cause of Saints, during the Beatification of Blessed Chavara said: Even though he (Chavara) could declare on his death-bed that he had always kept his baptismal innocence, he had a deep sense of sin. In this sense, he is a question mark to the modern world which seriously lacks the same sense of sin.